Rugged, hand-held and easy-to-use fiber optic test instrument designed to detect and measure the core power levels of optical signals on single-mode optical fiber without disrupting traffic on that fiber. The OFI-400C is simply clamped onto a fiber and indicates the presence and direction of traffic, CW signals and 270, 330, 1000 and 2000 Hz test tones. It allows technical personnel to unambiguously identify a specific fiber and eliminates the risk of accidental disruption of revenue service. NOYES OLS7, OLS2, CSS1-SM and CSS1-MM Optical Light Sources are ideal companions for the OFI-400C. The OFI-400C uses a unique optical head design featuring a 2-position plunger that enables it to be used with 250µm, 900µm and ribbon fiber or 2mm and 3mm jacketed fiber. Other brands of optical fiber identifiers require users to purchase, store and swap out optical plungers each time a different type of fiber is tested. The OFI-400C optical head induces a safe, repeatable macro-bend to the fiber that allows a small amount of light to escape for analysis. Thanks to the design of the optical head, the insertion loss induced by the macro-bend is too small to affect the signal on the fiber and the integrity of the fiber is unaffected by the measurement process. NOYES OFI-400C instruments are designed to be simple, easy-to-use and reliable. Each features and ergonomically-designed macro-bend trigger that is comfortable to use. An integrated, backlit display allows the OFI-400C to be used in dimly lit spaces. 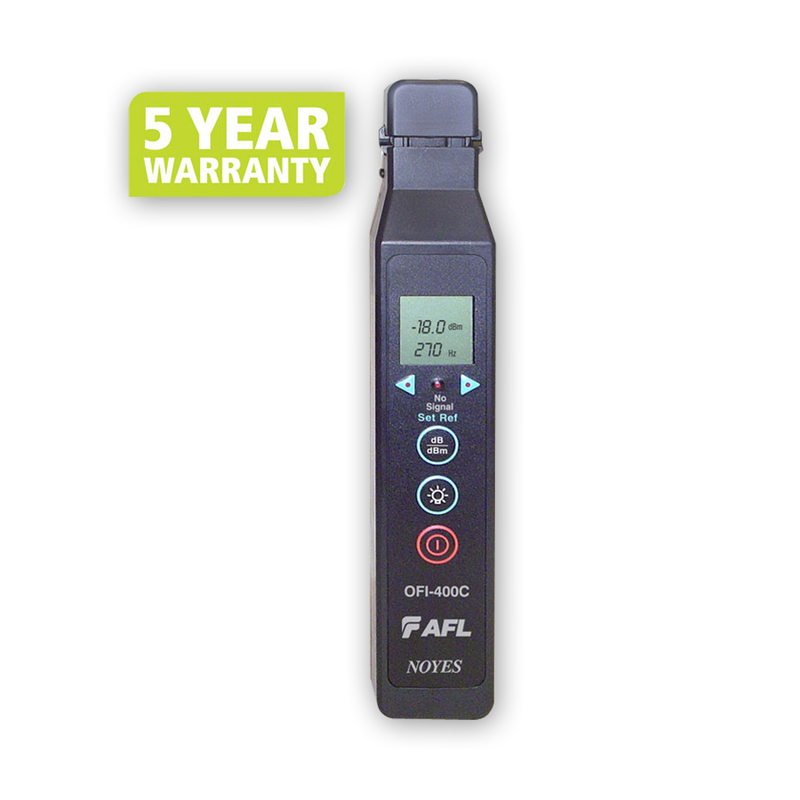 Powered by 2 1.5V AAA batteries, theo OFI-400C can make thousands of fiber tests before needing battery replacement.